Once the kids try garlicky oven-cooked potatoes, they eat them as readily as French fries, cooks say. 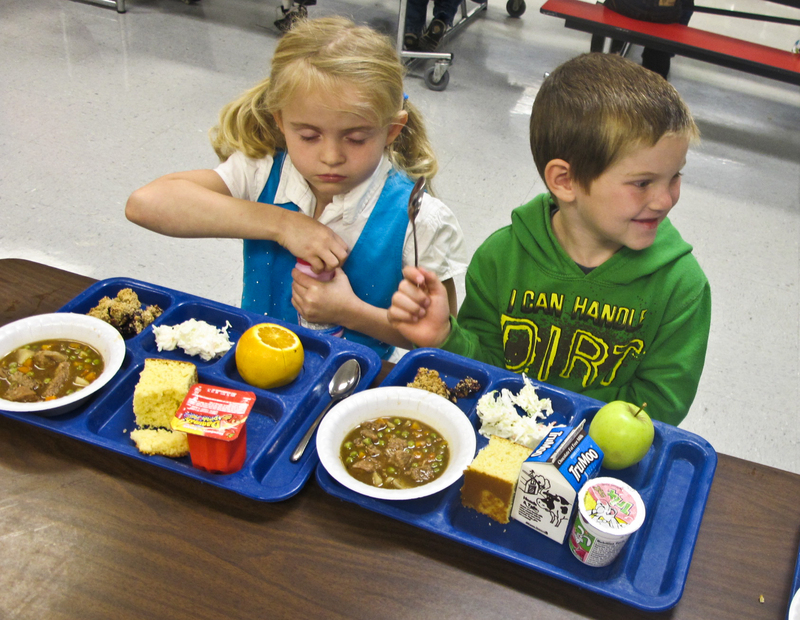 West Virginia is a national leader in the campaign for healthier school food. Soda and junk food machines are out of elementary schools. By the end of 2014, the state Office of Child Nutrition had trained cooks from every county to stop reheating processed food and cook from scratch. Click here for the vegetable-packed red sauce recipe and other “from scratch” recipes. And click here for ways to get money for the necessary equipment for your school. 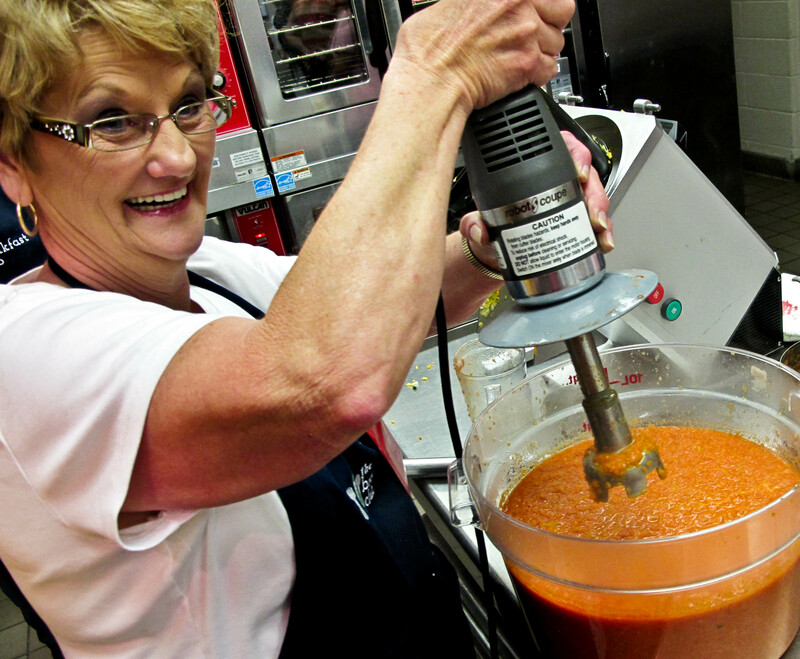 The Office of Child Nutrition is buying new equipment for cooks that lets them process big volumes of fresh ingredients quickly. Want to make sure your schools are minimizing processed food? 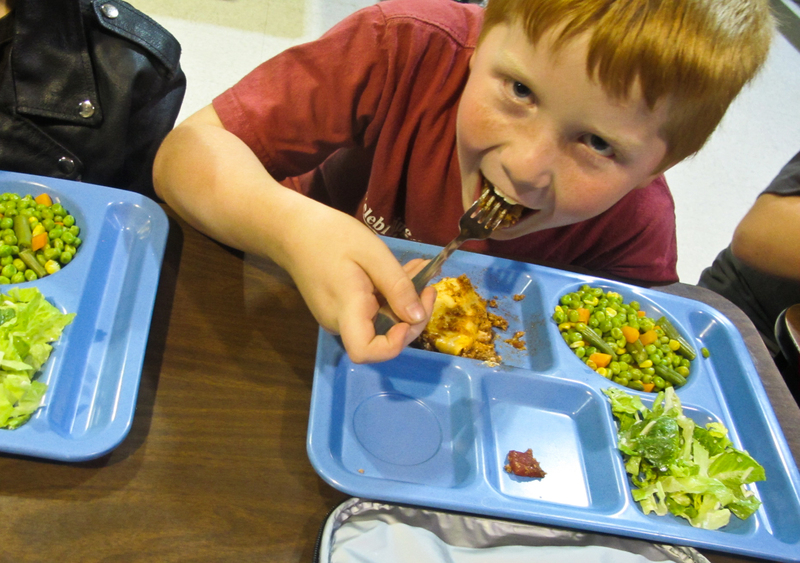 Some schools serve healthier food than others, “but we’re making headway,” says Rick Goff, state Office of Child Nutrition director. Get familiar with “Smarter Lunchroom” activities natiowide. Educate yourself and your group. Start with the www.smarterlunchrooms.org Web site. Local parents are important. Most cooks have been trained to cook from scratch, but they’re not required to do it. If parents ask for it, it’s much more likely to happen. Read your school menus. Ask questions. Is the chicken pre-cooked and processed or cooked from scratch? If you have questions about what you see, talk with the food service director. The situation may be better than it seems. The from-scratch pizza recipe, for instance, is made from vegetable sauce and whole-grain crust. Here’s a list of county nutrition directors: .http://static.k12.wv.us/child-nutrition/docs/county-food-service-directors.pdf. Every school system is required to have a Local School Wellness Policy. Here are details of the requirements. Call the WV Office of Child Nutrition if you can’t resolve a problem locally. Their staff can help you figure out how to solve a problem or can, in some cases, intervene. (304) 304-558-2708. 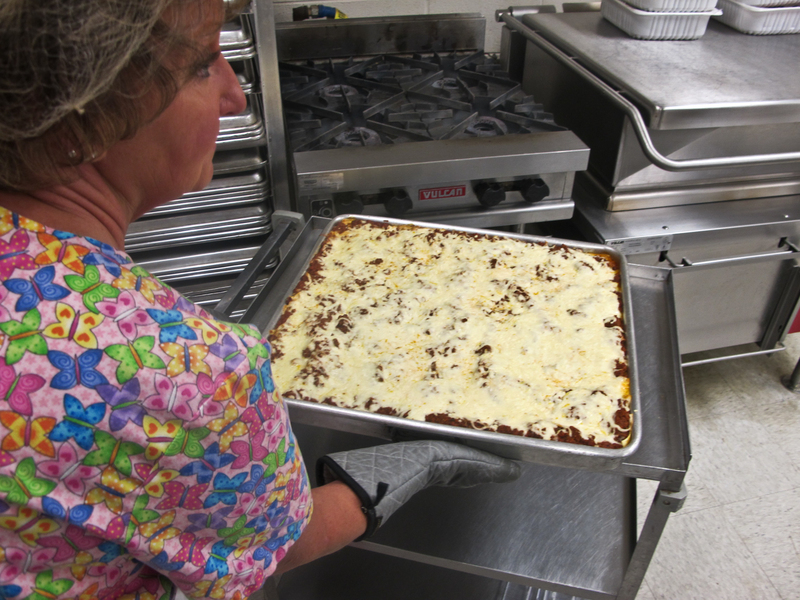 Find a roadmap to an ideal meals program, healthy school recipes, and information about individual schools, in the OCN’s publication, The Playbook: Creating a Model Food Service Program in West Virginia. 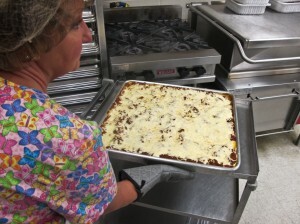 Cooks at Lincoln County’s Midway Elementary taking cooked-from-scratch lasagna from the oven. It will be paired with Ceasar salad with homemade ranch dressing, a vegetable and a cooked-from-scratch roll. 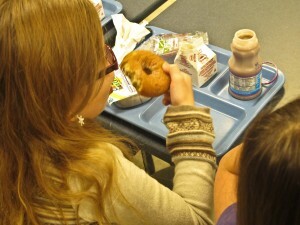 Check to see if your schools qualify and are participating in the healthy afternoon snack program. 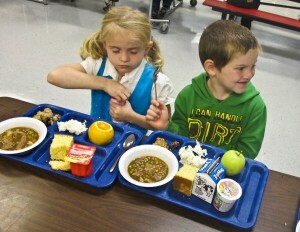 Check out the West Virginia School Nutrition Association facebook page. 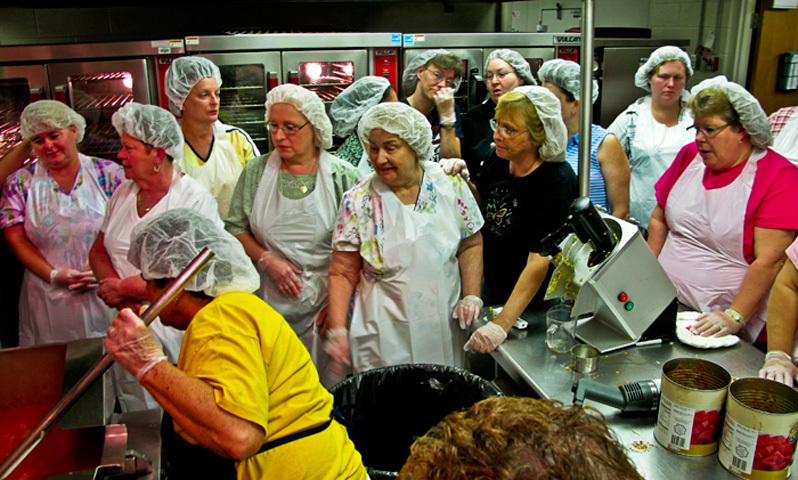 “The Great Kanawha Food Fight” includes a history of the Jamie Oliver episode and its aftermath. 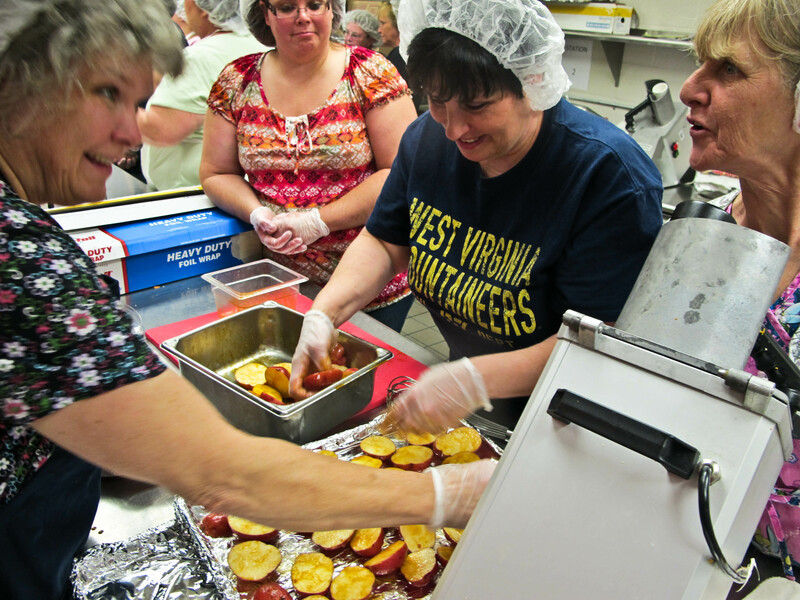 Mingo County kindergartners benefit by that training as they eat a lunch of cooked-from-scratch beef stew, cornbread, fruit and blueberry cobbler. Want to make healthier home-packed lunches? 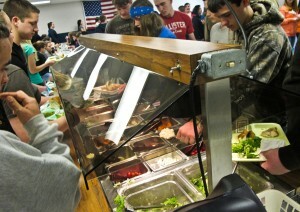 Gilmer County High School students generally wipe out the daily salad bar.